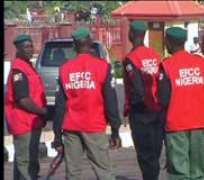 The Economic and Financial Crimes Commission the EFCC has arraigned six Ghanaians, a Nigerian at a Federal High Court in Edo state for alleged oil bunkering. The suspects were arrested on the 29th December, 2008, along Chanomi Creek, near Escravos in Delta State, by officers of the Joint Task Force (JTF). All seven suspects pleaded not guilty to a two count charge of Conspiracy and illegal dealing in 4,000 metric tonnes of petroleum products suspected to be crude oil, which authorities say were illegally bunkered in a vessel of 3,800 metric tonnes and 400 cubic metres, marked MT Hope. During Court proceedings, the defence lawyer, Nkire D. Nkire Esq moved for oral application for bail for the accused persons, a request the presiding judge, Justice Mohammed Idris vehemently opposed, and subsequently disposed on the ground that bail cannot be granted in a vacuum but must be based on merit and material facts which were lacking. Investigations conducted by operatives of the Economic and Financial Crimes Commission reveals that the vessel bore the name 'MT ATHINA' while in Ghana, but was changed to 'MT Hope' when it arrived Warri water ways. The case has been adjourned to the 19th of March, 2009, for consideration of bail application and commencement of trial, while the suspects are presently being remanded at the Benin prisons.